Learn how you can Resize, Rotate, and Flip video clips in PowerPoint 2010. In this series of tutorials on working with videos in PowerPoint 2010, you have already learned about correction adjustments for videos, recoloring video clips, and applying Video Styles, Video Effects, Video Shapes, and Video Borders that can help you enhance the look of your inserted videos. These options will make your video clips look better and focused -- and will provide you with ideas to make your video clips stand apart. Yet, there are some very basic video editing options that can be even more significant. These include how you can resize, rotate, and flip your inserted video clips. Resizing can help you change dimensions of your video clips, while slight changes in rotation values can draw attention. Flip, the last of these options though is something you will almost never use -- unless you want to do something drastically different! 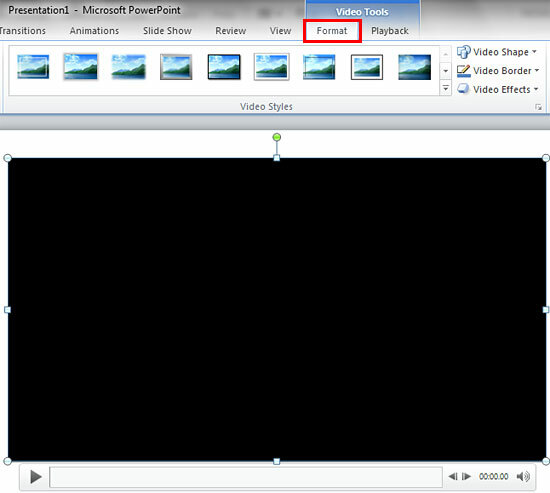 Open your presentation, and navigate to the required slide where you have already inserted a video clip. Just select or double-click the video clip to bring up the two Video Tools tabs in the Ribbon. These two tabs are Format and Playback -- click the Format tab to activate it, as shown in Figure 1 (highlighted in red). If you see the black rectangle in place of the video clip, then you will not see any live preview of resize, rotate, or flip applied on your video clip. This is because you see a black rectangle instead of a frame associated with the video clip. To make sure you see a video frame during live preview, add a Poster Frame to your video clip -- that way you will see a video frame in the place of black rectangle, as shown in Figure 2 below. Click and drag any of the blueish-white selection handles that show on the selected video, as shown in Figure 2, above. Tip: If you have set your video to play within a certain shape like a Teardrop, a Trapezoid, or a Star, then you can also drag the yellow diamond that appears along with the selection handles to manipulate the video's edges. You can also enter the values in inches or centimeters directly into the boxes -- if you want to type in values in inches, just type n in and press Enter on your keyboard, where n represents the value you want to type. Similarly, for centimeters, just type in n cm. To learn more about advanced options to resize the selected video clip, follow the instructions within our Resizing Shapes tutorial. Click and drag the green rotation handle that you can see highlighted in red within Figure 1, above -- towards right or left, as required. Additionally, you can press the Shift key and drag the rotation handle to rotate in increments of 15 degrees. To learn more about advanced options to rotate selected video, just right-click the video and, choose the Size and Position option in the resultant contextual menu. Alternatively, click More Rotations Options within the Rotate and Flip drop-down gallery that you can see highlighted in blue within Figure 4, above. Either way, you summon the Format Video dialog with the Size option selected in the sidebar (see Figure 5, below). Change the Rotation option (highlighted in red within Figure 5, above) to any value from -360o to 360 o or type a zero rotation value to restore the original placement of the video clip. Click and drag one of the side (not corner) blueish-white selection handles of the video, as shown in Figure 6, below. Note that side handles are square, unlike the corner handles which are round. Continue dragging even when you reach the end of the video until you have flipped it as required (see Figure 7, below). Remember that if you drag the selection handle too little or too farther, you may end up squishing the video! Locate the Arrange group within the Video Tools Format tab. Then click the Rotate button to bring up the Rotate and Flip drop-down gallery as you can see in Figure 8, below. 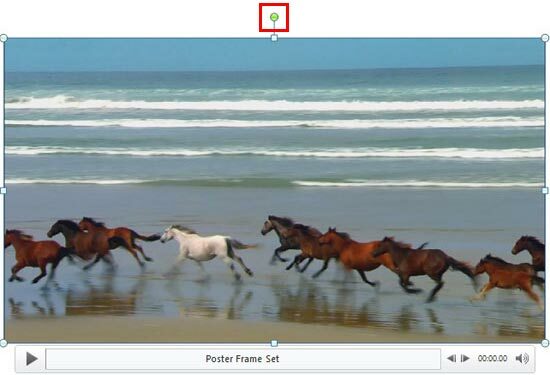 Choose any of the two Flip options (highlighted in red with Figure 8, below) within this drop-down gallery to flip your video vertically or horizontally.